WordPress 3.6 Released With Twenty Thirteen, Autosave Improvements and More! Way back in February we previewed WordPress 3.6. It’s been a long time coming — the original release date was 22nd April. Fast-forward to August and we are finally able to get our hands on the release version. As always, we recommend that you update your WordPress core immediately, not only to take advantage of the new features, but also to ensure that your website is best protected against potential security threats. Of course, with ManageWP you can update multiple websites in just one click. In the February preview I called WordPress 3.6 “the most promising update in a long time.” There was a lot to get excited about: Post revisions, improved autosaves, post formats, editorial flow, custom menus and more. The question is, does the end product live up to the original vision? The tradition of naming WordPress updates after jazz musicians continues — this release is in honor of the pianist Oscar Peterson. To get an overview of the new features (courtesy of a rather quirky video), press play below. 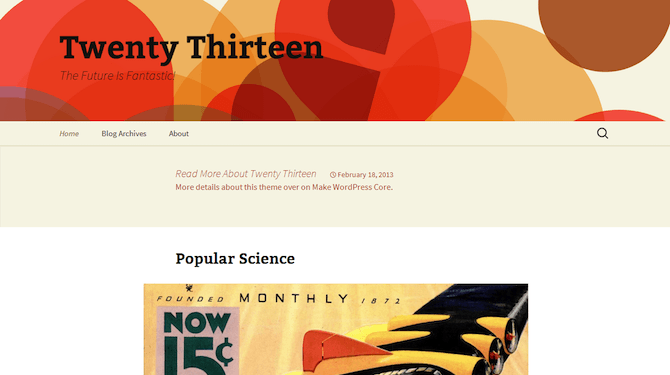 The new Twenty Thirteen theme — a fully responsive, single column, blog-centric design. A new audio/video API gives you access to metadata like ID3 tags. For a complete list of new features, check out the Codex. I’ve already got WordPress 3.6 installed on my blogs and I am pretty pleased with the end result. While we didn’t get everything that was originally mooted back in December 2012, the improved autosave functionality in particular is very welcome. But what do you think? After waiting over half a year, do you think that the latest update does WordPress justice? Let us know in the comments section below! Most i like with this new version is latest Twenty Thirteen. Responsive layouts are becoming priority and this theme has efficiently taken care different media queries. No doubt , there is scope for improvement but basic structure is very good. Cool core updates. But I think this new theme they’ve supplied is more of a tech demo for post types, would have preferred minimal like previous releases. I liked the idea of comparing the revisions, its going to be very useful and handy feature. So far, so good. I am really liking the integrated audio and video players.